How many waste did you produce today? A yoghurt pot, a plastic bottle, some fruit peel maybe? Did you recycle that? 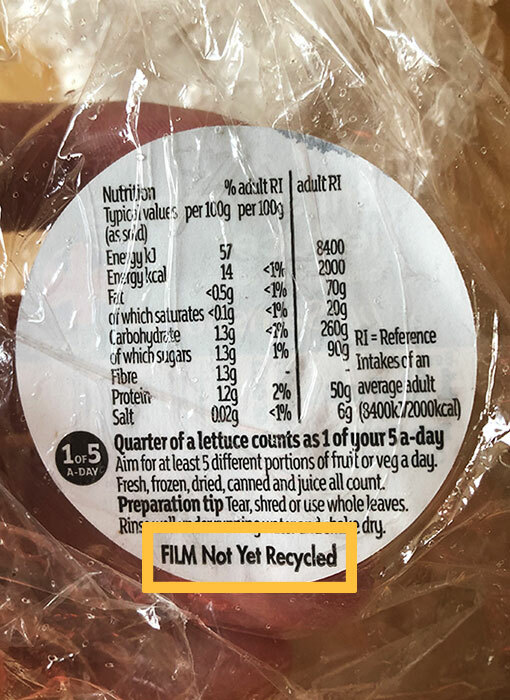 Are you sure you put that waste in the right bin? There is a bazillion of data out there about how the waste we produce is affecting the planet we all share and how recycling might help at least a little. Every day tons of garbage is generated and most of it does not make it to the right bin in order to be recycled. What do we need to recycle successfully? This is a concept project, part of the User Experience Design Immersive course I attended at General Assembly London. 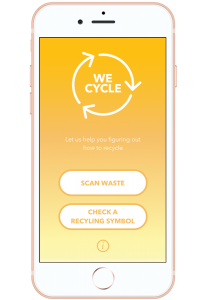 The goal of this project is to increase the recycling rates and focus on how to help people who already recycle to make it better. 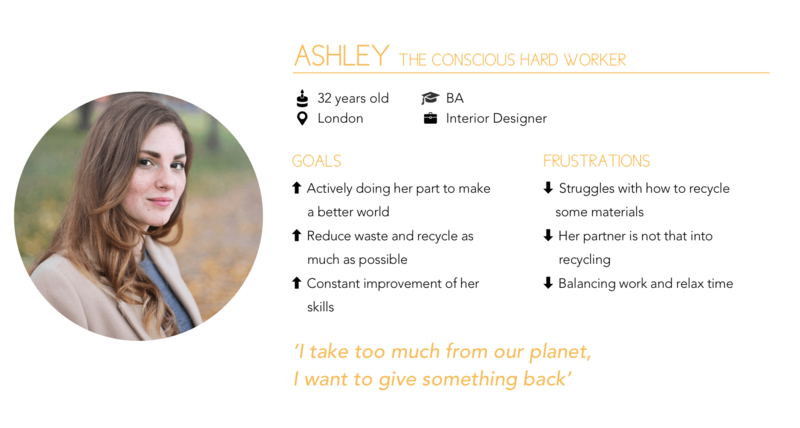 I conducted 10 interviews to understand how people recycle, the challenges they face, their motivations and needs. Recycling is a habit rooted in early education. They are motivated to recycle because they feel good doing ‘their part’. The main barrier is confusing information or the lack of it. A persona is a representation of a type of user, a key tool in the Human Centred Design framework as it helps to be focused on who are you designing for and empathise. After the user research, we already have several details about how the people we want to help are and some patterns appear. Combining these characteristics is how personas are created. Now is time to know our persona better and identify her pain points. How is a day in Ashley’s life? What problems does she face? How does she manage daily situations? What is the main need people have that my app can help to solve? 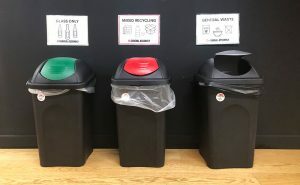 The findings of the research showed that people who recycle know how to recycle a wide range of waste, but they are confused about how to manage some materials. 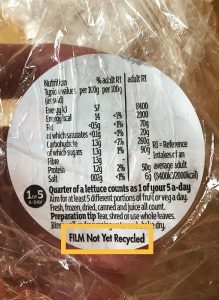 When the confusion is related to the material, people usually look for the recycling symbols that are often printed in the package. But even in these cases, they feel confused about the meaning of the symbols and things get more complicated if the package involves different types of materials. In most cases, the confusion is not related to the material but to the way it gets recycled. This barrier is linked to how the competent authorities manage waste, which differs depending on the location. There might be different policies even in the same city, as happens in London: There is no overall blueprint for how waste should be managed and each one of the 38 boroughs in this city has different systems. If we find a way to help these people to know where they should put each waste, more waste go to the right bin so more waste get successfully recycled. 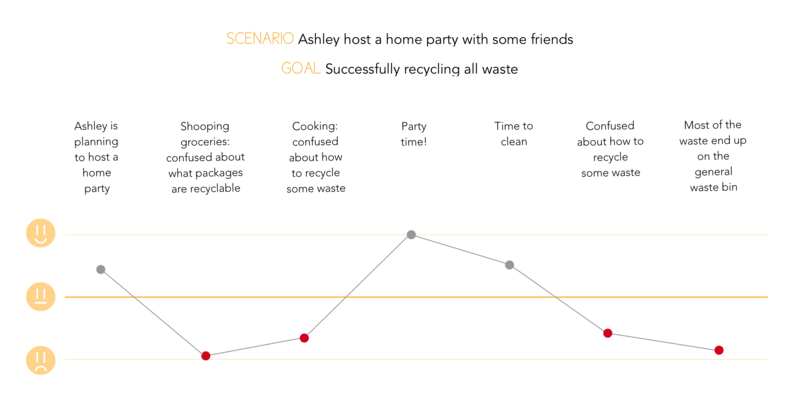 How might we facilitate people who strive for sustainability how to successfully recycle the maximum amount of waste they can? Once the problem is identified, it is time to start thinking about solutions. I ran a Crazy 8’s session to generate as many ideas as possible. This method is used in design sprints and workshops to stimulate creativity and bring ideas out of one’s mind. It is not about drawing well, it is about sketching possible solutions (or even the worst solutions, as the images below) to the problem we are trying to solve. User flows are very useful to start creating wireframes. It shows the steps my persona, Ashley, needs to accomplish her goal. This is the first step before sketching how the app will look like. 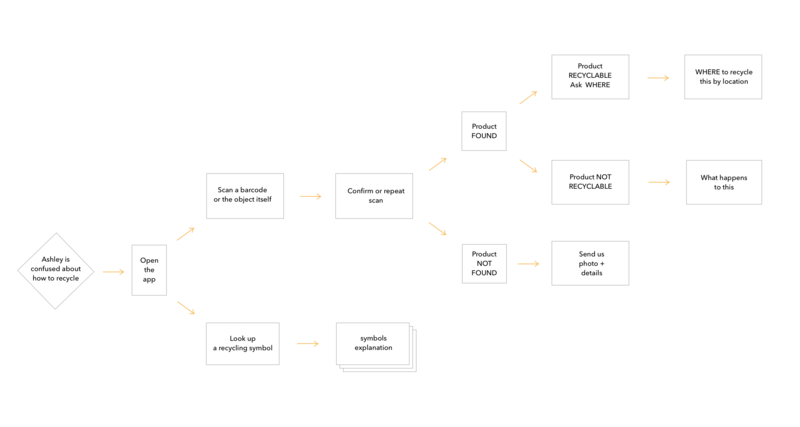 Those are the firsts drafts I made for the app, following the steps described in the user flow. The first screen the user would see is the camera to scan the waste. 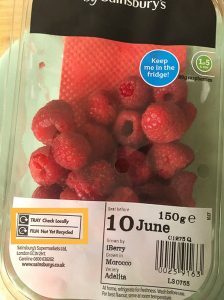 If the material were recognised, the information about where to recycle it correctly would appear. 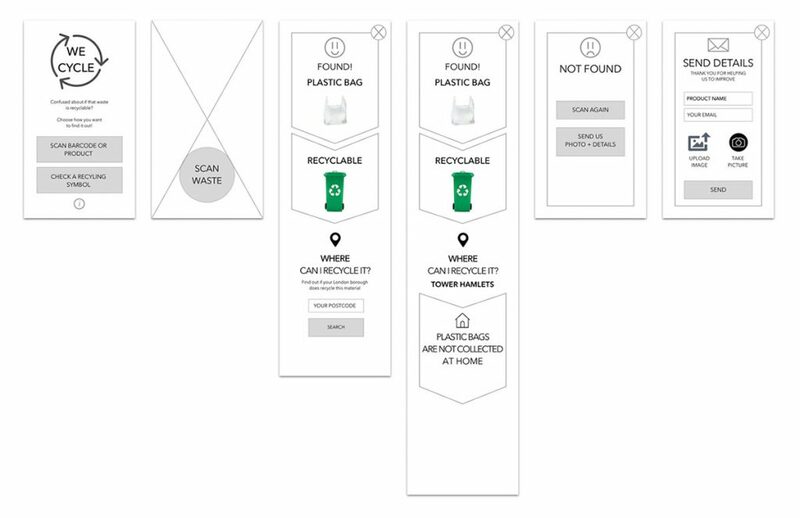 In case that waste was not recognised, the user would be able to send the details so the information could be added. 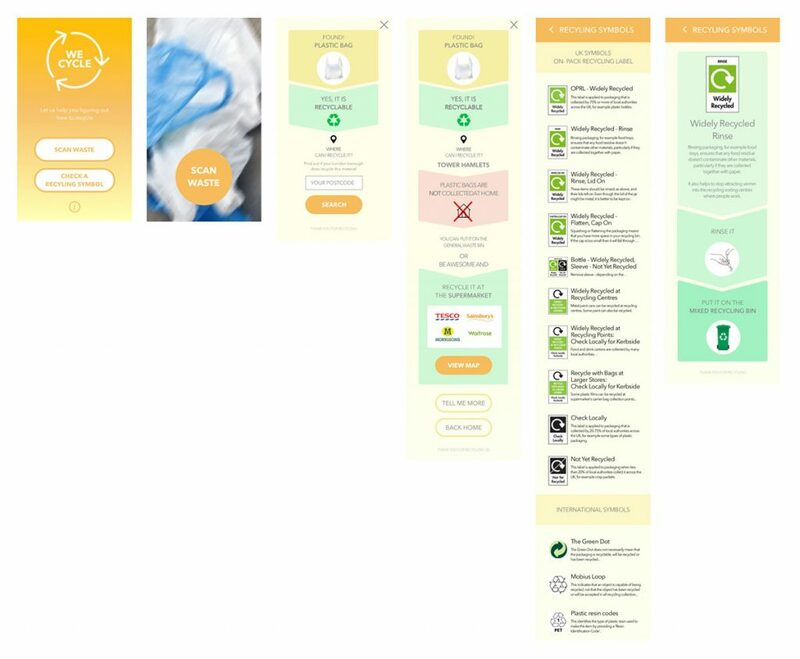 In addition to the scanning feature and the recycling symbols guide, I included a section related to the disposal of different types of materials and a section to show all that the user has scanned. This could be used by the boroughs to reward those who recycle the most, as Hackney is already doing with the initiative Hackney Recycling Rewards. With simplicity as my main goal and the amendments I made after a few usability testings, I created the mid and high fidelity wireframes.